Image by floresyplantas.net via FlickrI was recently looking at the ingredients for a product that I won't name, but I will say is sold exclusively to Boots, and I was curious by the addition of an ingredient called Cannabis Sativa Seed Oil. I'm not really up on the various types of drugs out there, but I do know that Cannabis/Marijuana (you know all the slang!) comes from a plant known as the Cannabis Sativa, which is a member of Cannabaceae family. And, despite what some over-zealous sixteen-year-olds might think, Cannabis is actually an illegal drug, so how come it can be used in beauty products? And, what on earth does it actually do? Well, the most important lesson that I learnt whilst researching this, was that there is actually a huge difference between the Cannabis that is consumed as an illegal drug, and the type that produces a type of Hemp Seed Oil. The second kind of Cannabis mentioned contains absolutely none of the pyschoactive properties that are associated with the drug, and is very commonly used in a variety of beauty products across the market. This Hemp Seed Oil is considered to be very beneficial to the skin, mainly because it is rich in fatty acids which work hard at keeping the skin looking young, and feeling great. Ultimately, Cannabis Sativa Seed Oil is classed, within the Beauty Industry, as an Oil. "From the hemp plant, Cannabis sativa. 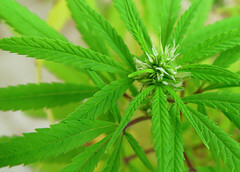 Because both hemp and marijuana are from the genus Cannabis, they are often thought (erroneously) to have similar properties. However, because hemp contains virtually no THC (delta-9-tetrahydrocannabinol), the active ingredient in marijuana, it is not used as a drug of any kind. In cosmetics, hemp seed oil is used as an emollient. Other claims about its effect on skin are not substantiated."